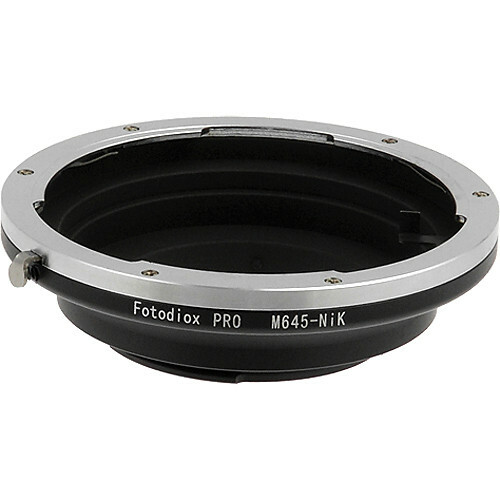 This Pro Lens Adapter from Fotodiox enables the use of your Mamiya 645 lenses on Nikon F mount SLR and DSLR cameras. It features a durable brass construction with stainless steel finish and its design also maintains infinity focus. This adapter is specifically designed for older, manual focus Mamiya 645 lenses and is not compatible with autofocus-enabled 645 lenses. This manual adapter does not maintain automatic lens control between the camera and lens; aperture priority or manual shooting modes should be used, as well as stop-down metering for exposure control. Box Dimensions (LxWxH) 3.4 x 3.2 x 2.0"
Pro Lens Mount Adapter for Mamiya 645 Lens to Nikon F Mount Camera is rated 4.6 out of 5 by 19. Rated 5 out of 5 by Scott from Quality product I have had the pleasure to sample many adapters, this unit is easily among the best. The fit and finish are top notch. I recently used the adapter with my F4s and the 80mm f/2.8 and 150 f/3.5, both performed very well and I didn't have one missed focus in a roll of print film. I will post a few samples and update my review asap. If you are looking for an adapter to use 645 glass with Nikon, you need to look no further. I am very happy with my purchase. Tip... inside the adapter you will see a small metal tab which is secured by one screw. Remove this tab if you wish to use your glass with the auto function so you can focus with the aperture wide open and simply flip the auto lever to stop for metering and your shot. Rated 3 out of 5 by BM_astrophotography from Mamiya adapter Not quite as advertised. Adapter was well made and very nice looking. However the adapter was missing the leaf strings, described in the B+H product description, that push the lens against adapter the lens is engaged. This lets the lens droop slightly when the lens is not supported horizontally. Rated 5 out of 5 by Emil from Works well Beefy all-metal construction. Fits both the lens and the camera body well. Focus to infinity.With this adapter, I can use any of the Mamiya 645 lens with my Nikon DSLR. And there are lots of very affordable Mamiya 645 lens out there in @ and @ with super quailty. Manual focus only though, and certain camera bodies support stop down metering. Otherwise, take a few test shots to iterate to the correct exposure. Rated 4 out of 5 by Ethridge from Great Quality Does what it's supposed to do (as expected). Better than the cheap one that I purchased on @ (which had some wobble or looseness). I now own both the Mamiya 645 to Nikon and the Mamiya 645 to Canon Fotodiox adapters and they are much better quality (proper machining) so there is no wobble. Highly Recommended! Rated 5 out of 5 by Sebastian from Analog meets Digital I salvage my Mamiya 645 lenses by using this adaptor on my brand new Nikon D800e. It fits perfectly in the camera body and lens making it seamless. Not so great about it: as a non CPU lens, the camera doesn't register all the metadata of it's shots. Great purchase, highly recommend. Rated 5 out of 5 by Mikhail Solovyev from Perfect adapter!!! Now you can install medium format lenses from Nikon D800 to my. Good build quality. Good blackening the inner surface. Rated 2 out of 5 by scott from Lens does not fit tightly enough to adapter, sloppy fit. One huge problem. Like at least one other PhotodioX adapter the Mamiya 645 lenses to not fit tightly enough to the adapter. As a consequence you can move the lens relative to the adapter. For example the lens will droop slightly if not supported. Similarly if you hold the camera for a portrait oriented shot it will droop in that direction. I don't know how much this will affect picture quality but I suspect it will. You can easily see the movement of the lens relative to the adapter and it makes a noticeable clacking sound when you apply a bending force between the adapter and the lens. The FotodioX Mamiya 645 to Sony E mount adapter has the same issue but I didn't realize it until it was too late to return it. It's really a shame as I would love to use my Mamiya lenses with my Nikon bodies. The build of the adapter is beautiful. I can't believe they didn't notice this when they started making them. Interestingly the FotodioX Mamiya 645 to Fujifilm GF fits firmly but the tripod mount is flimsy and out of alignment. Interesting. What Mamiya 645 lenses work with this adaptor? Only the latest digital lenses, older Mamiya AF film lenses, or even manual focus film era lenses? If they work, How do they perform image-quality wise in DX and/or FX modes? The Mamiya 645 lens mount did not change over time so all lens will mount on the adapter. Please be aware, with the newer AF models, the adapter has no provision to adjust the f/stop as this was done through the AF 645 camera bodies. Generally speaking, optical designs for larger formats do not have the resolving power for a lens designed for a smaller format such as 35mm. You might find 35mm lens outperform medium format lens when viewed side by side. The reason being that due to the larger capture area, there was no need to render detail in a small area. One advantage of using a medium format lens on a smaller format body is the ability to use swings and tilts much like you would on a view camera. How does the lock button work from adapter to lens? When I mount the lens to adapter I find by focusing the lens it can detach from mount. Would this adapter allow me to use 645 lenses on a F2AS body? I am not sure about how the lenses would index, if at all. As long as it is a 645 manual focus lens it should work, the male side is a F mount the female is 645 and it has a locking tab. You need a 645 lens with a aperture ring, there are no contacts or chips but this worked just fine on my D-810 and D-7100. I can't fit my 45mm 1:2.8 Mamiya Manual Focus lens on this adapter, though everything I've read says the lens should be compatible. Has anyone else experienced this issue? it fits into the adapter (aka sits in the grooves) but it will not click and lock. Do you have to apply a crop factor with this in place? For instance, does the 80mm becomes a 135mm? For my Minolta to Nikon, there was no change in focal length, so no crop factor. The only difference I noticed was when I used my wide angle lens and had to pay a little more attention to fine focusing.